Are these poke-constellations real ? 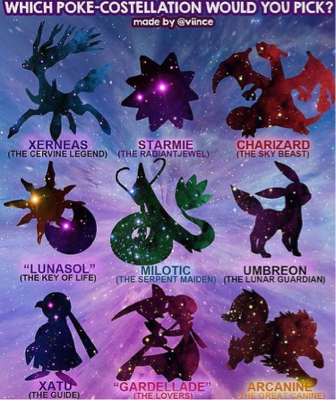 If so , then how do the constellations relate to the Pokémon , of vice versa ? And would you also please explain any other information you may have about the constellation and Pokémon relationship ? Or are these constellations just and only in the anime ? Believe it or not, constellations are a thing in the Pokémon universe. Well, sort of; they don't really have any lore behind them at all. This brings me to your image; with the exception of Milotic and Gardevoir, none of those constellations exist in any media related to Pokémon, according to Bulbapedia. Pokemon Channel is the only media in which both Milotic and Gardevoir appear as far as games, and in the movie Jirachi: Wish Maker, they are seen as well. ...Also, your particular picture is unofficial art work, so the likelihood of it being canon at all is pretty much nil. How do Poké Ball capsule and seals work?